Perhaps Branson's most iconic theatre, the Starlite Theatre's five-story glass atrium shines as a beacon for all things entertainment. 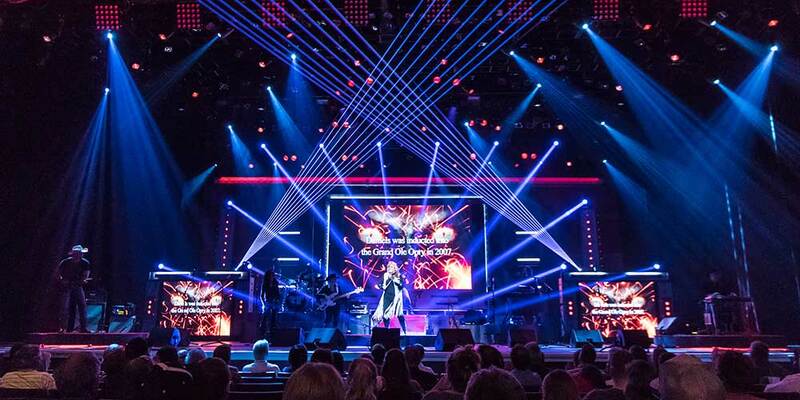 In the city lauded as the Live Entertainment Capital of the World, Branson's Starlite Theatre is among the top performance venues for guests to witness breathtaking singers, hilarious comedy, holiday shows and much more! Home to Grammy winners and more, the Starlite Theatre is the ultimate one-stop destination for all things entertainment. Country music stars like Larry Gatlin and The Gatlin Brothers, Billy Dean, Grammy winner Suzy Bogguss, Rhonda Vincent, as well as the Texas Tenors have graced the stage and will again in the coming seasons. You can also see comedy routines of local favorites such as Jarrett Dougherty and others keep audiences laughing uproariously with hilarious antics and stage comedy. Aside from the rip-roarin', boot-stompin', hilarious good times, you are bound to have at the Starlite, you can also spend some time sipping on a delicious milkshake or tasting a Branson-famous burger at the '50s themed Starlite Diner. Make sure you try the biggest banana split in town while you're here! With over nine scoops of ice cream, you might need some help from a friend.